As a user, connecting your agileBase calendar to your personal or business calendar couldn’t be simpler. We support many common apps such as Google Calendar, Office 365 and Apple’s. Two-way sync is supported, so you can create events in an external calendar and they will import into agileBase, or vice versa. Exactly how that happens and where the data goes is up to how an administrator configures the system – for that, see below. To connect your calendars, click your user icon at the top right of the screen and select ‘edit profile’. Then just click the ‘connect calendar’ link. You’ll see a screen asking you which service to connect to – please choose the one you use and you’ll be asked by that service whether it’s ok for agileBase to connect. If your company hasn’t used calendars before or if you’re expanding your users, it’s possible your organisation may need to purchase a calendar license. There’s a small monthly charge for this, to cover third party service costs, please do get in touch if you’d like to set it up. As an administrator, you can choose whether to sync incoming or outgoing events, or both. You can also set up where new events go, for example you might have a meetings table in agileBase that you want new calendar entries to be imported into, or different external calendars might want to go to different places. The first step is at any rate to set up a table in agileBase called ‘ab calendar intray’. You can prefix it with something, e.g. ‘z) ab calendar intray’ if you like, just to order it alphabetically in your tables list. The table is where incoming events from your Google/Microsoft/Apple etc. calendars will be added. 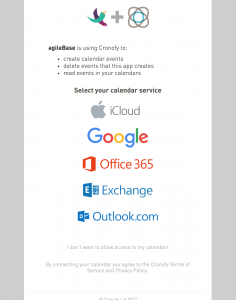 We will be happy to set this up for you when you enable calendars in your system, if you prefer. Once those tables are there, connect your calendar (or ask your users to connect their calendars) as per the top of the page and watch as the tables fill up with events! New records will be added immediately, whenever a user creates, updates or deletes a new event in their external calendar. Then it’s up to you where this information goes. We typically recommend setting up a trio of workflow views based on ‘ab calendar intray’. If you’d like details and examples on how to set these up, please let us know, we can supply some useful patterns, or do the setup for you. The later fields are optional – the field names must be present but the contents may be blank.